"Road Test. Ford Fiesta 1.3 GL"
Thank you to Vinny (aka RacMan) for supplying this article. IN A little less than four years, over 1.5 million Fiestas have been built, which makes Ford's first front-wheel drive car its most successful new model of all time. Last year only five cars (two of them Fords) outsold the Fiesta in the UK, where it is the most popular small hatchback by a huge margin. Despite this success, Ford spotted a gap in their coverage of the market, and it is for this reason that the Fiesta GL was introduced last month. With a specification based on that of various limited-edition Fiestas (75th Anniversary, Kingfisher, Millionth Edition and Sandpiper), the GL is designed to slot in between the L and Ghia models. It is offered with either the 1,100 cc or 1,300 cc engine, and it is the latter which is the subject of this test. The GL package includes a centre console containing a clock and a push-button radio, an illuminated locker on the passenger's side of the facia and a parcel tray on the driver's side, a cigarette lighter, a vanity mirror, rear grab handles, a carpeted luggage compartment, halogen headlamps, 4J in road wheels with bright trim, a tailgate turnlock and a protective body-side strip. The 1.3 GL is priced at £3,874 (the 1,100 cc version costs £3,674), and at this price the competition is plentiful and varied. Opel's new front-drive Kadett costs £3,645 in 1.3 LS form, but this is with the low-compression engine; the high-compression GL, with similar performance to the Fiesta, is only offered as a four-door or five-door, and costs at least £250 more than the Ford. Similarly, there is not a Polo with an engine larger than 1,100 cc, while the equivalent Golf (1.3 LS three-door) costs £4,105. Perhaps the closest rivals are the Vauxhall Chevette 1.3 GL (£3,772), the Renault 5TS (£3,935) and the Mazda 1400 SP £3,899); if a hatchback is not regarded as essential, the choice becomes even wider. In other respects, the GL is identical to the 1300S version, its all-iron transverse front engine of 1,298 cc capacity producing 66 bhp (DIN) at 5,600 rpm, peak torque of 68 Ib ft (DIN) coming in at 3,250 rpm. This pushrod ohv motor drives the front wheels via a four-speed gearbox, all of whose ratios are indirect. The front suspension is by MacPher-son struts and coil springs, and the geometry of the steering (which is by rack and pinion) is of the negative offset type. At the rear, a dead axle is located by trailing arms and a Panhard rod, and on this 1300 version, added stiffness is provided by an anti-roll bar. 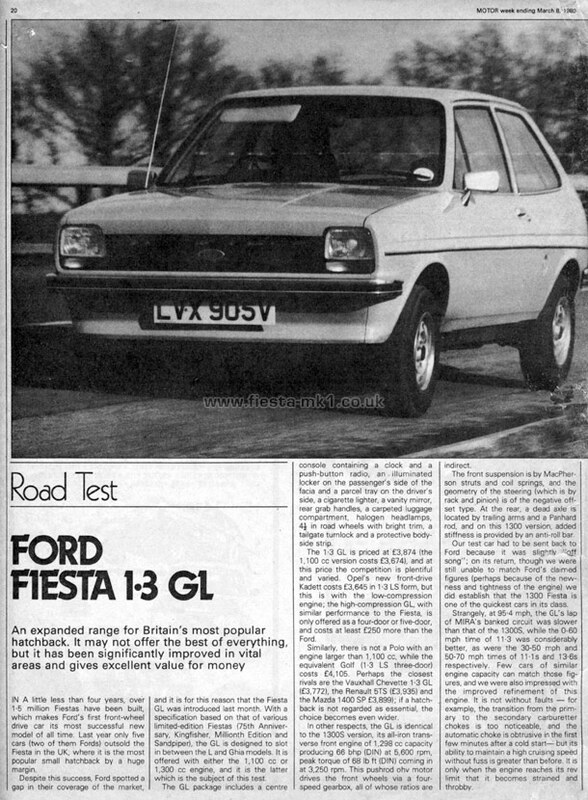 Our test car had to be sent back to Ford because it was slightly "off song"; on its return, though we were still unable to match Ford's claimed figures (perhaps because of the newness and tightness of the engine) we did establish that the 1300 Fiesta is one of the quickest cars in its class.